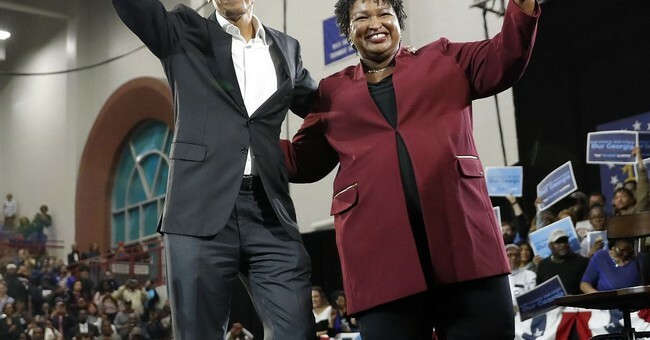 Failed Georgia gubernatorial Democratic candidate Stacey Abrams has officially given up attempting to win the 2018 Georgia election over her Republican opponent Brian Kemp, but that does not necessarily mean that she buys the legitimacy of the voting process. In a remarkable and defiant speech on Friday, Abrams announced that the election results prove that democracy has failed in Georgia and that Brian Kemp, as Georgia's Secretary of State, engaged in widespread voter suppression. Despite the facts disproving this argument as well Abrams displaying political hypocrisy, the Democratic candidate is still telling her supporters she lost because of "deliberate and intentional" interference. Today on CNN's State of the Union, Abrams said these nefarious actions have been occurring for the past 8 years. I moved to Texas in 2017. My voter registration is still active in Georgia. After time, I will get a letter that I will not respond to, won't vote in federal elections -- and my name will get removed. To the conspiracy theorists, that is a "purge" & me getting "disenfranchised."